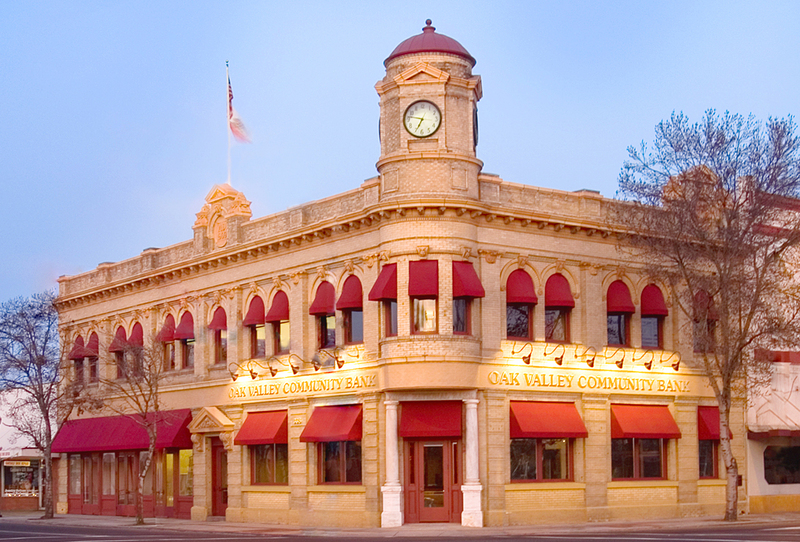 Oak Valley Community Bank was founded in 1990 by a group of businessmen with a vision to make local banking available to its community. Thanks to our dedicated staff, loyal customers, shareholder support, directors guidance, our vision continues to grow. Oak Valley Community Bank opened its doors in Oakdale in May. By the end of 1995 the Oakdale Branch exceeded $41 million in total assets. The Sonora Branch was opened, helping to push total assets over $55 million. Oak Valley opened the Modesto Branch, taking total assets to $85 million by year-end. After three years of steady growth with three branches, year 2000 started a new era of expansion - when Eastern Sierra Community Bank was established, with its first branch in Bridgeport - a market that proved ready to embrace the spirit of community banking. By the end of 2000, the Bank's total assets were $134 million. The Mammoth Lakes Branch was opened. The Bishop Branch was opened. A second Modesto Branch opened in March. Turlock Branch opened in January. Stockton office opened doors in Sherwood Executive Suites in September. Patterson Branch opened in November. Ripon Branch opened in December. McHenry Branch relocated in February 2006. The new branch occupies the ground floor of the 12th Street Plaza Building at the corner of 12th & I Street in Downtown Modesto. Escalon Branch opened in April. Completed reconstruction on historic First National Bank, Clocktower Building in April 2007 and opened lobby of the "Corner Branch." Full service Stockton Branch opens December. Established Oak Valley Bancorp in July. Received NASDAQ listing approval in January. Relocated Mammoth Lakes Branch to central core of the town's main shopping district on Old Mammoth Road in February 2010. The Bank increases its coverage of Modesto. Third Modesto Branch opened at the corner of McHenry and Sylvan Avenue in June. Manteca Branch opened in August. Tracy Branch opened in December. Downtown Sonora Branch opened December. Oak Valley received Federal approval of acquisition of Mother Lode Bank in December. In May, the bank celebrates 25 years of Deep Roots ~ Strong Branches. Bank opens Loan Production office in January, later announcing plans to open full-service branch in Sacramento. East Sonora Branch relocated to 14890 Mono Way in March. Turlock Branch relocated to 241 West Main Street in April. Sacramento-Capitol Mall Branch opened in September. Today the Bank has 17 branches and over $1 billion in total assets. With deep roots and strong branches, we strengthen our local communities and economies by channeling loan dollars back in the neighborhoods where our depositors live and work. Oak Valley Community Bank has always been a leader by supporting the communities with financial services as well as the way our staff has always generously given of their time and talent. We have built our business by developing relationships, meeting the needs of our customers through personal service and responding to these changing needs, while maintaining our commitment to quality products and service. We are committed to the markets we serve and committed to providing a responsive, personalized alternative to the big banks that dominate our industry today. Our directors and staff continue to look for opportunities in the communities near our existing branches to bring good “old-fashioned” banking. We're proud that in the age of mergers and buyouts, Oak Valley Community Bank remains locally and independently owned and we're committed to staying that way. To some banks, maybe that's no big deal, but to the team of professionals at Oak Valley Community Bank, it's what local banking is all about. Enjoy your visit on our website, but please stop in at one of our branches and let us introduce you to the real Oak Valley Community Bank difference … the people. Call 866.844.7500, click here or stop by today! !